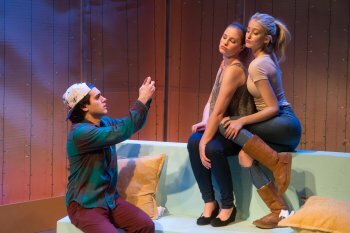 A series of short plays that examines the pros and cons of a social media obsessed culture, and the different ways this impacts the youths of today. In the past ten years, social media has exploded worldwide and become a necessary part of life for any individual that is even remotely interested in staying relevant. Connected by Lia Romeo explores the role that social media plays in the lives of “millenials” or those that were born into the golden age of the Internet. Connected is a series of short plays, each tackling our always-connected culture from a different angle. The first of four stories is about Meghan, a high schooler with a crush on one of the most popular guys in school. Midori Francis, the charming actress playing Meghan, decides to ask her crush to the prom and, after her theatrical prom proposal gets caught on camera and uploaded to YouTube, Francis’s timid teen reaches web celeb status, with her video collecting one million views in 24 hours. This story has a lot to say about what it means to be popular, and the juxtaposition of a down-to-earth girl rising to celebrity status opens the door to a thought-provoking conversation about the fickleness of fame, and the isolation that ironically comes with it. Following the story of an overnight web sensation is that of a group of party-hoppers, two girls that use social media services like Instagram and Snapchat to keep tabs on all of the parties going on in their neighborhood so that they can keep up with the cool crowd. The end result for popular girls Jill and Sarah—Gus Birney and Ella Dershowitz—is a wild goose chase which has them leaving a “lame” party to head to another, arriving after everyone else has left, then heading back to the original destination which, in their absence, turned into a rager that they then missed out on while they were gone. There to tell the girls about the fun they missed is Sam, played by Aria Shahghasemi. In one of the more grounded performances of the evening, Shahghasemi is a misunderstood outsider whose authenticity lies in stark contrast to the superficiality of his companions. Despite their differences, the three teens agree to make the best of the situation and resolve to enjoy the rest of the night. After Sarah passes out, Jill and Sam have a heartfelt conversation which gets heated when Sam questions Jill’s empty pursuit of popularity. The next two stories go hand-in-hand, and explore the similar theme of just how easy it is for people to conceal their identities behind an online avatar or profile. Ella Dershowitz is back in this third story as Sharon, a high school graduate who spends all her free time playing World of Warcraft. After she connects with another player named Mark (Joachim Boyle), the two decide to set a date to meet in person based on the fact that it seems they have a lot in common despite the fact that they’ve never met in real life. Boyle’s character ends up being exactly as he portrayed himself, but Sharon can’t say the same. Boyle would have been completely willing to look past any superficialities for the sake of getting to know a like-minded person, but unfortunately looks aren’t the only thing that Sharon wasn’t being honest about. The final story of the evening delves deep into the notorious dating app Tinder. Dana Jacks plays Ms. Haverill, a high school teacher who just transferred from another school district. Feeling lonely, she signs up for the app in the hopes of meeting new people. After a student of hers discovers her profile while on the app, Jarred (Aria Shahghasemi in a different role) deceptively creates a fake persona and coerces his teacher to go on a date with him. Eventually Jarred comes clean and owns up to his deceptive behavior, and Jacks’ heartfelt performance sparks a conversation between teacher and student that makes light of the universality of loneliness. 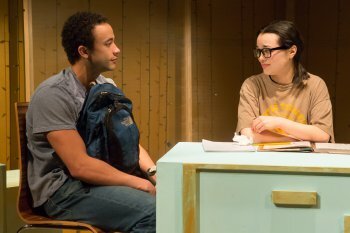 Presented at 59E59 Theaters, the set design by Matthew J. Fick is clever and ties into the theme of an underlying connectedness. Set pieces protrude from the walls of the set in different angles and directions, and the pieces come apart and serve different functions in each scene. The walls are painted vibrant neon colors, which adds to the youthful tone of the evening, and a flat screen display hangs center stage ironically. While the set design itself is impressive, the scene changes at times ran quite lengthy—even between scenes in the same story. Despite this, director Michole Biancosino does a nice job negotiating scene changes and transitions in the tiny Theater C at 59E59—the smallest of the three theaters at the venue—and keeps the constant flow of different actors on and off the stage fluently. Among all four plays, a majority of the scripted characters are high school students and, though there are genuine moments of authenticity throughout, there are also multiple instances of actors forcibly playing down their own age to appear younger. 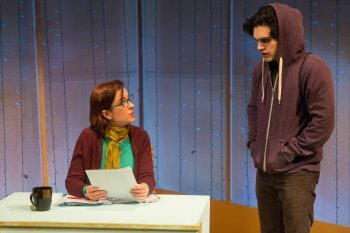 Connected is thought-provoking in that it suggests some scary things about where our culture is headed as a whole, but the choice to tell four different stories instead of one truly powerful story lessens the impact of the overall message and instead, the show feels more like a short play festival than a meaningful think-piece. This captivating silent performance piece depicts a tempestuous romantic triangle through dance, movement, music and puppetry all laden with symbolism. Richard Masur gives a sensitive performance in this two-hander about a friendship between a crotchety septuagenarian and a nine-year-old girl. Chekhov’s “The Seagull” proves to be an excellent plotline for a poignant and entertaining country western musical led by Kate Baldwin and Bob Stillman. Charming romantic comedy with a dose of serious problems treated lightly. After a funeral, daughter finds evidence of her father’s traumatic experiences in Vietnam in this generic drama with fine production.